If you have W-2 forms to file for annual wage reports for employees, the easiest way to file these is online. Here's what you need to know. When is the Deadline for W-2 Forms? The filing deadline was moved up a few years ago.The deadline to file W-2 forms with the Social Security Administration (SSA) is now January 31 of the following year, beginning in 2018 and going forward. For 2018 W-2 forms, the filing deadline is January 31, 2019. That is a month earlier than the former filing date. The change was made to help prevent tax fraud, and the earlier date applies to all filings including both paper and online submissions. Your filings will be considered on time if they are submitted by this date, and filing online is much easier and more convenient. 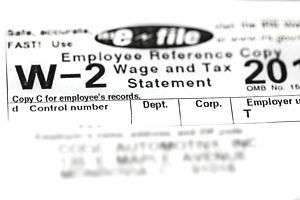 W-2 forms must be given to employees no later than January 31. It's a good idea to give completed W-2 forms to your employees early in January so they can look them over and you can make corrections if necessary before the deadline. What Are W-2 Forms and W-3 Forms? W-2 forms are used to report employee wages and salaries to the Social Security Administration (SSA). The SSA shares the information with the IRS for income tax purposes. You must issue a W-2 form to each employee from whom you've withheld FICA taxes (Social Security and Medicare) and federal and state income taxes. You must also issue a W-2 form to anyone who should have had income tax withheld but did not for some reason. W-3s are transmittal forms that must accompany W-2s. They summarize the information on all the W-2 forms you send to the SSA. A W-3 is not required if you file your W-2 forms with the SSA online. How Do You File Online? You can e-file W-2 forms online at the SSA's Busines Services Online (BSO) website. It is free and secure. The SSA very much prefers that you use this option rather than submit paper records. The BSO offers two options. You can create fill-in versions of these forms and print out copies for filing with state or local governments as well as for distribution to employees and for your own records—up to 50 at a time. Or, you can simply upload your wage files if you use tax or payroll software. The Social Security Administration states that if you file 250 or more W-2 forms during a calendar year, you must file them electronically unless the IRS grants you a waiver. You may be charged a penalty if you fail to file electronically when required. E-filing saves time and effort and helps ensure accuracy, according to the IRS. And you can avoid calculating and submitting a W-3 transmittal form because the Social Security Administration will generate a W-3 automatically when you submit your W-2s. You can also use the BSO site to verify Social Security Numbers for wage reporting purposes. The site offers a tutorial, handbooks, a checklist, and other useful information to help you e-file those forms. You can submit W-2c forms here also to correct an error if you make a mistake in one or more W-2 forms after you have filed. You must first register with the Social Security Administration's BSO section before you can submit your W-2 forms online. Then, create and save your W-2 forms using a special file format and submit them to BSO. You can view the uploaded files and see error reports after the files are submitted including name and Social Security number mismatches. This allows you to make any necessary corrections. You can also review the status of your submission and see if the file has been accepted.